JACKSONVILLE, Fla. (CNS) — Drawing on the imagery of the empty jars at the wedding feast at Cana, Archbishop Christophe Pierre challenged Catholics at the 2017 Florida Eucharistic Congress to identify what is missing from their lives and ask Jesus to transform them as he did water to wine. 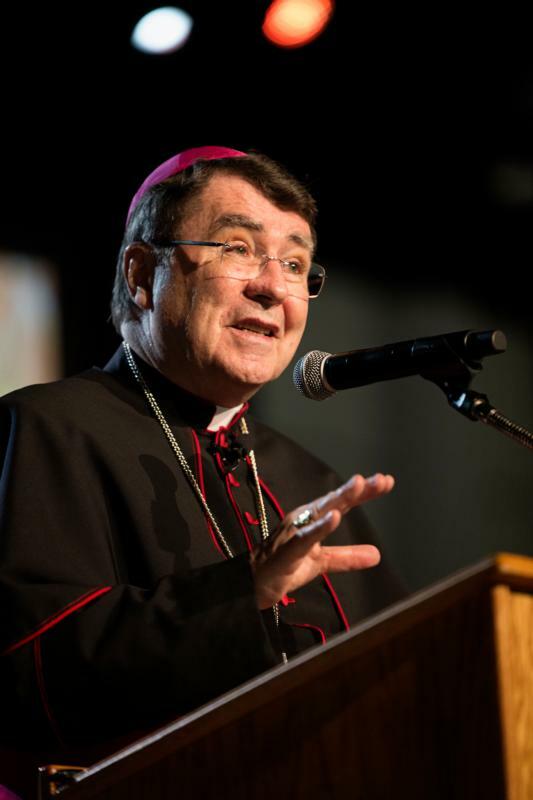 Archbishop Pierre, the apostolic nuncio to the United States, was the keynote speaker March 25 at the annual congress in Jacksonville, in the Diocese of St. Augustine. He addressed the congress theme, “Do Whatever He Tells You,” which was Mary’s instructions to the servants at the wedding feast. Archbishop Pierre said there is a strong connection between Mary and the Eucharist. “Her body is the place of the incarnation. In her body was born the body of Christ,” he said. At Mary’s request, Jesus performs his first public miracle at the wedding feast. “The disciples saw his glory and began believing in him,” Archbishop Pierre said. Archbishop Pierre said Mary brings a woman’s sensibility to the occasion. Amid the noisy festivities, she is attentive to the needs of others. “She is fully aware that Jesus can remedy the situation,” he said. Even when he responds, “Woman, what does this have to do with me? My hour has not come,” she is not deterred. The archbishop said the image of the six empty jars is a useful metaphor. “Every epoch has nights and the nights of our time are not few,” Archbishop Pierre said. He listed six areas of emptiness he sees in modern life: lack of joy; lack of giving; lack of memory; lack of prophecy; lack of beauty; and lack of silence. As he addressed each area, he asked a group of six people to pour water into a jar. The first group was led by Bishop Felipe J. Estevez of St. Augustine. Culture values people for what they do and have rather than who they are as individuals, he said. The second jar represents the lack of giving, the increasing selfishness in today’s world, he said. The wealthiest 20 percent of the world consumes 76 percent of the world’s resources. To fill the empty jar, the culture of consumption and individualism must be challenged and a new spirit of generosity cultivated. The third jar represents lack of memory, the loss of connection with the past. The fifth jar represents the lack of beauty, the dominance of brutality and brokenness. Modern life is characterized by a lack of harmony, by moral and ethical relativism, excess in the consumption of goods, immoderate speech and dress, he said. The sixth jar represents the lack of silence. “We live in a culture of noise. Lack of silence threatens our culture. We talk past each other. We are unable to listen and communicate deeply. Without silence it becomes increasingly difficult to develop a spiritual life, especially when God speaks in a whisper,” the archbishop said. Archbishop Pierre called on Catholics to fill the jars every day and to be open to Christ’s miraculous power to transform whatever is put in them. Ross writes for St. Augustine Catholic, the magazine of the Diocese of St. Augustine.